When you are looking for the best residential air conditioning contractor in the Glastonbury CT area, call Charter Oak Mechanical. We are your number one resource in Hartford County for all your residential heating, cooling and HVAC needs. Charter Oak Mechanical is a Central Connecticut air conditioning contractor that installs state of the art residential cooling systems. With our energy efficient equipment installed in your home, you will pay lower energy bills while enjoying quiet comfort during air conditioning season. A home air conditioning system can be provided by a centralized system or a standalone air conditioner. Air conditioning provides cooling and humidity control for all or part of a building. Before installing an air conditioning system in your home, it is critical that all the space around pipes and ducts be completely sealed to assure positive air pressure. Windows must be sealed for an air conditioning system to work effectively. The ductless mini split heat pump has provided homeowners with a very good option for economical heating and cooling options in difficult spaces or older homes. Also known as ductless heat pumps, mini-splits, or inverter heat pumps, these systems serve as Heating or Air Conditioning units. Ductless mini-splits are wall or ceiling mounted units and need no ductwork. Ductless mini-split systems are ideal for spot cooling situations in homes and businesses where ductwork is either not available or difficult to install. It is important for contractors to have ductless mini splits in their portfolio of HVAC solutions for certain situations. 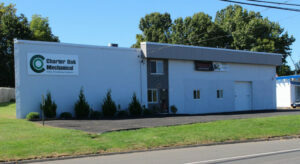 Charter Oak Mechanical has been the premier heating, ventilation, air conditioning, refrigeration, and custom ductwork specialists in Connecticut for over 25 years. Charter Oak Mechanical can service your residential or commercial business anytime and we stand by our work with our guarantee. If you are unhappy with your Home Comfort System’s cooling or heating and we can’t fix it, we will remove the equipment we installed and refund 100% of your original investment at any time during the first year. It doesn't get any better than that! Give us a call or look around our website for more information on how our best heating contractors can help! Charter Oak Mechanical is accredited by the Better Business Bureau. Call Charter Oak Mechanical today at (860) 432-8915.